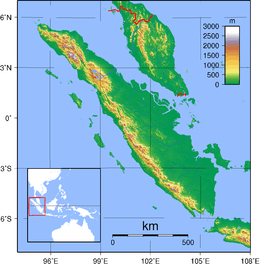 Sumatra (Indonesian: Sumatera) is an island in western Indonesia and part of the Sunda Islands. 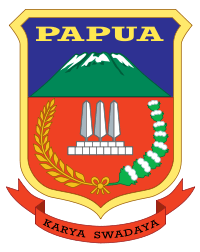 It is the largest island that is entirely in Indonesia (two larger islands, Borneo and New Guinea, are shared between Indonesia and other countries) and the sixth largest island in the world at 473,481 km2 (including adjacent islands such as the Riau Islands and Bangka Belitung Islands). 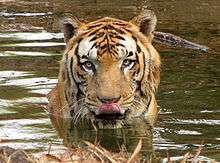 Sumatra has a wide range of plant and animal species but has lost almost 50% of its tropical rainforest in the last 35 years, and many species are critically endangered such as the Sumatran ground cuckoo, Sumatran tiger, Sumatran elephant, Sumatran rhinoceros, and Sumatran orangutan. Deforestation on the island has also resulted in serious haze over neighbouring countries, such as the 2013 Southeast Asian haze causing considerable tensions with affected countries such as Malaysia and Singapore. Srivijaya was a Buddhist monarchy centred in what is now Palembang. Dominating the region through trade and conquest throughout the 7th to 9th centuries, the empire helped spread the Malay culture throughout Nusantara. The empire was a thalassocracy or maritime power that extended its influence from island to island. Palembang was a center for scholarly learning, and it was there the Chinese Buddhist pilgrim I Ching studied Sanskrit in 671 CE before departing for India. On his journey to China, he spent four years in Palembang translating Buddhist texts and writing two manuscripts. The ten administrative Provinces (provinsi) of Sumatra – including the smaller islands nearby – are listed below with their populations at the 2000 and 2010 Censuses. Note some 4 million of these residents of Sumatra do not live on the island itself—but on nearby islands administered collectively as "Sumatra". The final two of the provinces below do not have territory on the actual island. 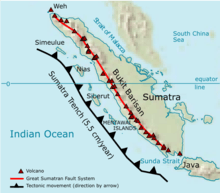 The Great Sumatran fault (a strike-slip fault), and the Sunda megathrust (a subduction zone), run the entire length of the island along its west coast. On 26 December 2004, the western coast and islands of Sumatra, particularly Aceh province, were struck by a tsunami following the Indian Ocean earthquake. This was the longest earthquake recorded, lasting between 500 and 600 seconds. More than 170,000 Indonesians were killed, primarily in Aceh. Other recent earthquakes to strike Sumatra include the 2005 Nias–Simeulue earthquake and the October 2010 Sumatra earthquake. The island is home to 201 mammal species and 580 bird species, such as the Sumatran ground cuckoo. There are 9 endemic mammal species on mainland Sumatra and 14 more endemic to the nearby Mentawai Islands. There are about 300 freshwater fish species in Sumatra. The people of Sumatra are multi-lingual, multi-diverse and multi-religious. Most of these groups share many similar traditions and the different tongues are closely related. Ethnic Malays dominate most of the eastern coast in the provinces of Riau, Bangka-Belitung, South Sumatra, Riau Islands, northern parts of Lampung and Bengkulu and in the easternmost parts of North Sumatra and Aceh, while people in the southern and central interior speak languages related to Malay, such as Lembak (that speak Col language), Kerinci (that speak Kerinci language) and Minangkabau people (that speak Minangkabau). The highlands of northern Sumatra is inhabited by the Bataknese, the northernmost coast is dominated by the Acehnese, while southernmost coast is dominated by Ethnic Javanese. 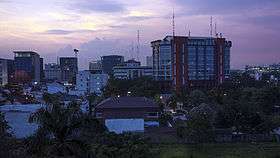 Chinese and Tamil minorities are present in urban centres. There are over 52 languages spoken, all of them (except Chinese and Indians) belong to the Nuclear Malayo-Polynesian sub-branch of Malayo-Polynesian which in turn is a branch of the Austronesian language family. 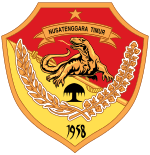 Within Nuclear Malayo-Polynesian, they were divided into several sub-branches that is Chamic (which are represented by Acehnese in which its closest relatives are languages spoken by Ethnic Chams in Cambodia and Vietnam), Malayic (Malay, Minangkabau and other closely related languages), Northwest Sumatran (Batak languages, Gayo and others), Lampungic (includes Proper Lampung and Komering) and Bornean (represented by Rejang in which its closest linguistic relatives are Bukar Sadong and Land Dayak spoken in West Kalimantan and Sarawak (Malaysia)). Northwest Sumatran and Lampungic branches are endemic to the island. 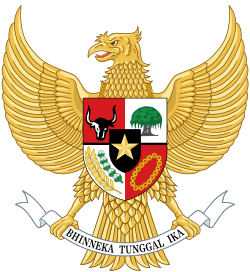 Like all parts of Indonesia, Indonesian (which was based on Riau Malay) is the official language and the main Lingua franca. 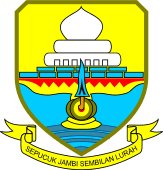 Although Sumatra has its own local Lingua franca, variants of Malay like Medan Malay and Palembang Malay are popular in North and South Sumatra, especially in urban areas. Minangkabau (Padang dialect) is popular in West Sumatra, some parts of North Sumatra, Bengkulu, Jambi and Riau (especially in Pekanbaru and areas bordered with West Sumatra) while Acehnese is also used as an inter-ethnic means of communication in some parts of Aceh province. A majority of people in Sumatra are Muslims (87%), while 10% are Christians, 2% are Buddhist and 1% are Hindu. 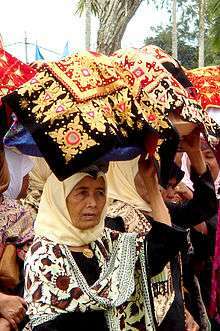 Most central Bataks are Protestant Christians, a faith introduced by the German Rhenish Missionary Society. ↑ Drakard, Jane (1999). A Kingdom of Words: Language and Power in Sumatra. Oxford University Press. ISBN 983-56-0035-X. ↑ Sneddon, James N. (2003). The Indonesian language: its history and role in modern society. UNSW Press. p. 65. ISBN 9780868405988. ↑ Macdonell, Arthur Anthony (1924). A practical Sanskrit dictionary with transliteration, accentuation, and etymological analysis. Motilal Banarsidass Publ. p. 347. ISBN 9788120820005. ↑ Reid, Anthony (2005). 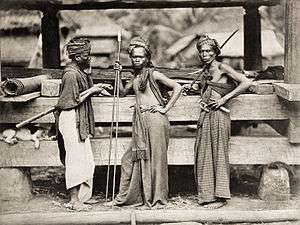 An Indonesian Frontier: Acehnese and Other Histories of Sumatra. National University of Singapore Press. ISBN 9971-69-298-8. ↑ "Indonesia agrees Aceh peace deal". BBC News. 17 July 2005. 1 2 Biro Pusat Statistik, Jakarta. ↑ Glenday, Craig (2013). Guinness Book of World Records 2014. The Jim Pattison Group. p. 015. ISBN 978-1-908843-15-9. ↑ "Daerah Produsen Kopi Arabika di Indonesia". Kopi Distributor 1995. 2015-02-28. Retrieved 2015-02-28. 1 2 Whitten, Tony (1999). The Ecology of Sumatra. Tuttle Publishing. ISBN 962-593-074-4. ↑ staff (2008-10-14). 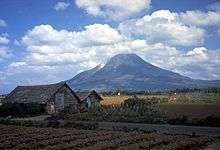 "Forest, Wildlife Protection Pledged at World Conservation Congress". Ens-newswire.com. Retrieved 2012-07-25. ↑ "Population Statistics". GeoHive. Retrieved 2012-07-25. ↑ "Number of Population by Religion Year 2005". ↑ Younger, Scott (6 November 2011). "The Slow Train". Jakarta Globe. Retrieved 19 July 2015.